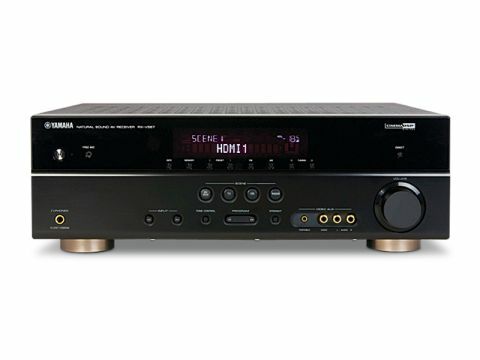 The 7.1-capable RX-V567 from Yamaha – a company that has played a pivotal role in popularising home cinema – is not the most affordable model in its line-up, but at £400 still looks like a bit of a bargain. The problem is, almost every other AV brand is aggressively targeting this end of the market, so does it do enough to stand out? It certainly gets off to a good start, with connections on the V567 including four HDMI 1.4 inputs and seven analogue AVs – including one on the front panel. Each is 'fixed' and has its own remote selection button, although you can marry the audio associated with one of these inputs to an HDMI (which also support 3D, the audio return channel, and CEC device-control). This is useful if, for example, your set-top box cannot deliver 5.1 via HDMI but has a digital audio output. It can also be tied in with Yamaha's 'scene' function, which is an array of four customisable buttons. Pressing one of these selects a specific source and soundfield. The latter is a Yamaha speciality. Its 32-bit DSP chip is combined with 24-bit/192kHz Burr-Brown DACs. You can choose from 17 soundfields, all of which are modelled on 'real-world' venues. The V567 covers all of the essential surround sound formats and codecs, although Dolby Pro- Logic IIz and its 'height' channels are conspicuous by their absence (something which Sony has specced on its similarly-priced STR-DH810). Hi-fi enthusiasts will appreciate the V567's compatibility with stereo/multi-channel PCM and DTS 96/24 soundtracks. If you're using a universal player with an HDMI output, then DVD-A and even SACD/DSD content can be enjoyed. Another worthwhile feature is that analogue video sources (up to 1080i for component) are converted to HDMI, so only one cable is needed. Conversion quality is excellent for a low-priced unit – 480/576p, 720p and 1080i/p conversion can be selected, but upscaling of HDMI isn't permitted – it's switching only. The V567 may lack USB or networked audio, but a dedicated rear-panel socket readies the V567 for an optional iPod dock or Bluetooth receiver that can wirelessly stream music stored on devices like multimedia-savvy mobiles. Already built-in is switchable enhancement for compressed audio sources. Yamaha claims this signal processing will restore depth and dynamics. The V567 is easy to set up; the well-organised menus cater for speaker configuration, input-trimming (to eliminate volume 'jumps' after switching), lip-sync adjustment and Pro-Logic IIx decoding tweaks amongst others. The V567 also features YPAO auto-calibration. We recommend carrying out speaker and level setup before using it, otherwise some odd errors can result. There's also a user-controlled graphic equaliser allowing you to boost or cut each channel over seven different bands. The V567 turns in a very creditable performance, certainly from movies. On a DVD of Avatar, the wildlife sounds of the night-time Pandora jungle are conveyed with awesome detail. The closing battle also fares well. Steering is superb, as revealed by the missiles zinging between speakers. Switching to the hi-res soundtracks of Blu-ray, specifically Cloudy With A Chance of Meatballs, demonstrates that the V567 can cope equally well with even subtler details. With music, matters aren't so clear-cut. In some of the DSP modes, bass passed to the subwoofer sounds unpleasantly monotonal. There's also an overall muddying of the soundstage that can be tamed, but not entirely eliminated, by engaging the 'direct' mode. Our Tech Labs also rate the V567 poorly in terms of raw power, with a measurement of 20W-per-channel into 8Ω with five channels driven. That's still enough for a small-scale setup – exactly the target market for a low-range AVR of this ilk – but should be taken into account when you're drawing up your audition list.